When a company targets a tech product exclusively at women, it could end up making a huge pink mistake. This is not the case with Netatmo's June, a new wearable designed to help ladies avoid getting too much skin-damaging sun exposure. Announced at CES 2014, the Innovations Award-winning June is a UV sensor that looks like a costume-jewelry crystal. 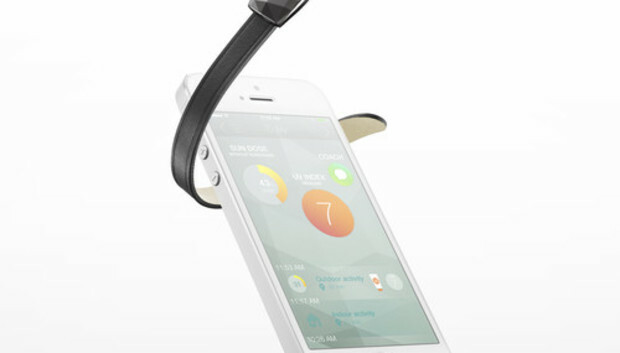 It comes with a leather band that makes an attractive bracelet, plus a sportier silicon band for when you're exercising. And you can also attach it to your shirt like a brooch, stick it on your headband Blair Waldorf style, or pop it on your purse strap. The jewel comes in three colors: gold, platinum (think silver) or gunmetal (gray/black). But cute as it is, the June is seriously high-tech. When setting up the iPhone app (the app is iOS only for now, with Android support coming soon as more phones add Bluetooth LTE support), you tell it how fair your skin is, on a 1-to7 scale, and then on a daily basis you can tell it if you're wearing sunscreen or not. The sensor tracks UV intensity in real time--both UVA and UVB rays, indoors and out, in sunny weather and when it's overcast. Throughout the day, the app can show you what percentage of the maximum recommended exposure for your skin type you've gotten. This lets the June app warn you before you get sunburned, so you can go inside, slather on more sunblock, put on a hat, or find some shade. Sun damage is no joke, and every woman knows that maintaining beautiful skin doesn't happen by accident--you have to take care of yourself and your skin to prevent not just lines and wrinkles, but serious diseases like melanoma. June will be available in the second quarter of 2014 for a suggested retail price of $99. We can't wait to review it.